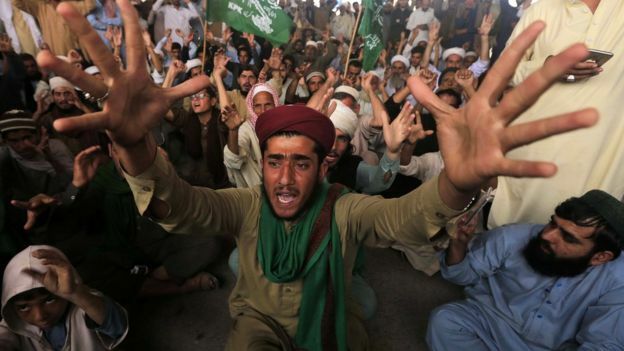 Demonstrations against the verdict are being held in Karachi, Lahore, Peshawar and Multan. Clashes with police have been reported. The Red Zone in the capital Islamabad, where the Supreme Court is located, has been sealed off by police, and paramilitary forces have been deployed to keep protesters away from the court. 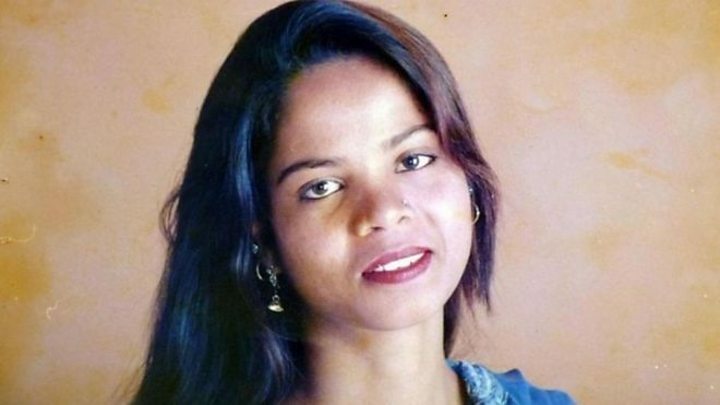 Chief Justice Saqib Nisar, who read out the ruling, said Asia Bibi could walk free from jail in Sheikupura, near Lahore, immediately if not wanted in connection with any other case. She was not in court to hear the ruling, but reacted to the verdict from prison with apparent disbelief. "I can't believe what I am hearing, will I go out now? Will they let me out, really?" AFP news agency quoted her as saying by phone. The court delivered its verdict quickly, no doubt aware of the sensitivity of the case and the danger of a violent reaction to it. Asia Bibi's lawyer, closely flanked by a policeman, told me he was "happy" with the verdict, but also afraid for his and his client's safety. The killer - Mumtaz Qadri - was executed, but has become a cult hero with a large shrine dedicated to him on the outskirts of Islamabad. His supporters also created a political party - campaigning to preserve the blasphemy laws - which gathered around two million votes in this year's general election. 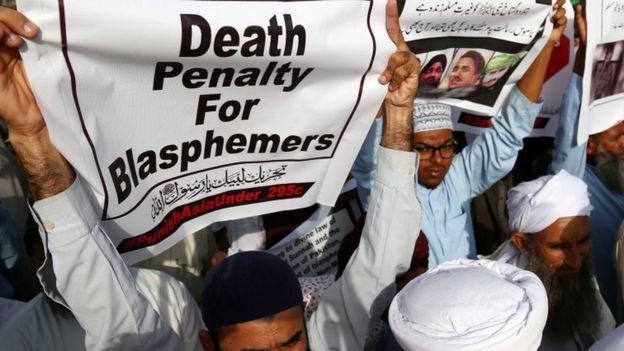 What is blasphemy in Pakistan? Laws enacted by the British Raj in 1860 made it a crime to disturb a religious assembly, trespass on burial grounds, insult religious beliefs or intentionally destroy or defile a place or an object of worship, punishable by up to 10 years in jail. The judges said the prosecution had "categorically failed to prove its case beyond reasonable doubt". The case was based on flimsy evidence, they said, and proper procedures had not been followed. The alleged confession was delivered in front of a crowd "threatening to kill her". The ruling heavily referenced the Koran and Islamic history. It ended with a quote from the Hadith, the collected sayings of the Prophet Muhammad, which calls for non-Muslims to be treated kindly. Many of the attacks are motivated by blasphemy cases, but others have come in reaction to the US-led war in Afghanistan. No-one has ever been executed under the laws, but some people accused of the offence have been lynched or murdered. 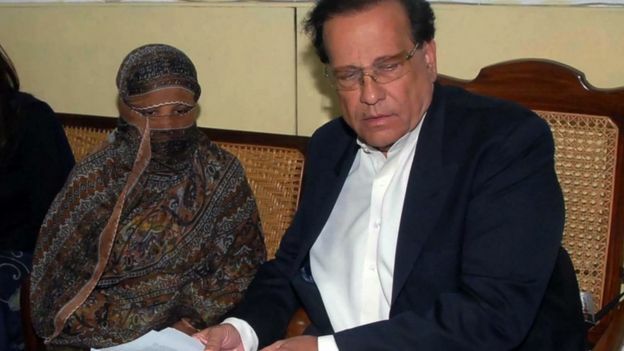 Asia Bibi, who was born in 1971 and has four children, was the first woman to be sentenced to death under the laws. Internationally, her conviction has been widely condemned as a breach of human rights. As with her previous trials and appeals, large crowds gathered outside the court in Islamabad on Wednesday demanding her conviction be upheld and the execution carried out. She has been offered asylum by several countries and is expected to leave the country. Her daughter, Eisham Ashiq, had previously told the AFP news agency that if she were released: "I will hug her and will cry meeting her and will thank God that he has got her released." But the family said they feared for their safety and would likely have to leave Pakistan.